I had an interesting talk with an extended family member the other day. I had just informed her that I was reading a particular book about marketing for unique business models. She reacted (sorry to you if you read this) very negatively, and simply responded: “Well, the government is certainly not going to help us, at least not for another 4-5 years”. “Things are not good”. Is this how you feel too? Well, this is a very common thought out there. I hope this post can make you think or see things a little differently. Perhaps see some way to take decisive action. If EVERYTHING relied on you, and ONLY you, what would you do? What 7 things should you consider for permanent, long term power and success? It’s true that you become what you think about. So, if you only think about “negative things” – it will end up getting into your life. However, success is never made over night. A saying exists (paraphrasing here): “Every great accomplishment is the compound effect of a thousand small steps”. You’ll have to start with the first step. Is it more competitive today than say, 10-20 years ago? Do you still stand a chance? Do you think requirements have changed? It may surprise you, but the answer found is a total “NO”. However, what was true back then, is true now: you must have very clear goals. And, you have to have good information, and be on a continual learning path. You get stuck in a rut if you think you know it all. It’s more about the things you “didn’t know you needed to know”. To get there, you must learn new things. You will need to become a master at what you do, and to deliver outstanding value. While flipping burgers at McDonald’s may be fine for a quick summer job early on in life, you are not going to be a top performer. Top performers belong to the top 20%. You know the 80-20 rule, right? The top 20 get all the action (money) on the table, and the rest get the breadcrumbs. Try to get into the top 20%. To do this, you must seek out what they do, and learn about what, and how they think. This is very important, because you can learn this too. You have to find out what the top performers do, and do it over and over until you also got it. What unique skills do you need? You need skills to deliver performance – to get results that other people will give you money for. If you think that others have a greater edge, you may be wrong. In fact, studies show we all start at the same place when we’re born (more or less). Successful keep increasing their skills to get better and better. They narrow and focus down to the skill that helps them the most at that time. You don’t need to know it all. If you could pick one thing that you could do, or a skill that could really propel you forward? What is that? You must know this. Then, go deep on that particular thing, and master it. You need to make sure you don’t get off track. There are too many shiny objects, and with the prominence of ADD – Internet in specific, you are probably staring into the eyes of the enemy every day. Inspire others to provide results, and become a provider of returns yourself. If you are in business, you must have a high quality product and/or service. This is a big key to success. Match the excellence of a product into a hungry market. It will sell itself – you don’t have to worry about slick advertisement, although promotion is part of the marketing 4 P’s of success (Product, Price, Place and Promotion). How cool is the iPhone as a product? You have to stay on top of industry trends, and be in a constant process of refinement and reinvention. If you complain that things change too fast, too soon, and the government is not helping, you are doomed. 2. Family / relationships – what is there that you want to change? Lifestyle, things you do, spend time on, communication, etc. If life was ideal in every area, what would it look like, and how would it be different from today? What would you have to do today, to make change in that anticipated direction for the future? 3. Health – if you’re health was different from today, what would it look like – and what would you do to change it now (small steps are fine). 4. Financial situation. Different than income, since some people make a lot of money, but cannot keep it, they are always broke. Others, who make less/little money, die wealthy. They’ve learned a way to live that is different from the constant spender. The default setting for us humans is financial destituation. Research shows that net worth at 40 years of age is about 16k. At 60 years, net worth is 50k. You need the disciplines to get there. Ask not what is your income, but what is your net worth. Poor people talk about income, rich people talk about net worth. True. 5. Education – what things, skills, things do you need to learn now. If you are not getting better, you are getting worse. You have to continue to build anew. 6. Community – we must be engaged – from business networks, clubs, political groups, ec. If not, we become insular, sad and worse. Ask this: What difference can I make in this world? Perhaps start by giving back into your local community. 7. Spiritual development – this is the most important. Think, reflect and read material that uplifts you and bring power to you from the universe, it’s the most valuable thing you can do to enhance your life. 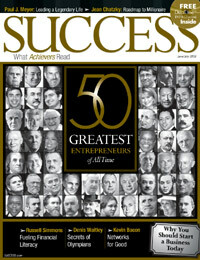 How many would open and take action on all the awesome things found in Success Magazine? Taking the first step is the difference between winning and losing. So, it’s clear you will need to change your way of thinking. As you grow older, and at least in this country, you may get a sense of entitlement, and start coasting. That is a one-way direction, and too many people are doing this. Most of the population will only do what’s expected of them to not lose their job. For example, a person may be 10 years into the job, gotten comfortable, associate with others at a low level of performance and it becomes their world view. They never get any better. A simple change for you would be to start adding more education to your life. Get a self-help, human development, or spiritual books, business topics and CD’s that educate, uplift and change your way of (stinkin’) thinking. If you read one book a week, or listened to educational audio programs, you could read 4 books a month. You know what this means over time. You’ll be far ahead of your current group of people. You would stand out. It’s that simple. Set aside 10% of your monthly (net) income, and get books, CD’s, go to seminars, and spend it on your existing learning, to build your future. Reading to the mind, is like exercise is to the body. You’ll become a much sharper person. The cumulative effect is extraordinary. How many hours do you drive every week? How much do you listen to music, talk radio, news versus inspirational, uplifting, educational information? You get the drift – probably not much. However, your potential is unlimited. You know that we are using only 10% of our potential. Your imagination is unlimited, and having clear goals will set you free. You need a roadmap, you don’t need to be a genius. Our own self-doubts and limitations are only our own. It’s not the world view. Sometimes, you just need to take some life coaching courses (recommended).